I learned this lesson a long time ago. Over the years we tried gardening at the family cabin up north. No matter how much wire we added to the enclosed fence, we could not keep out God’s creature’s great and small. The usual line up of suspects included deer, grouse, squirrels, crows and birds, a ground hog and only God know who else. What is it about America’s love for walls? Yes, some walls need to be built for safety, marking boundaries and creating reasonable order. On the other hand, what are walls supposed to do? Keep one safe? Keep one’s possessions safe? Keep out undesirable people? Keep out unhealthy influences? 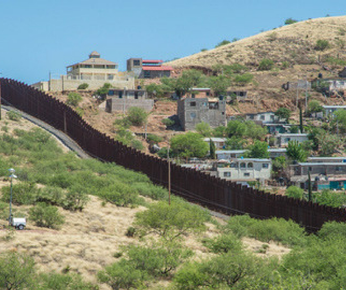 I heard the story of a group of people who worked out an arrangement with the local lumber yard to build a short section of the Great Wall of Mexico. Then three groups of people were given this mission: How fast you can get over the wall; dig under the wall or go through the wall? The three teams accomplished their tasks in minutes. Is this a parable for our times? Bible Readings For The Week: Sunday January 22: John 5:2-28; Monday January 23: Mark 5:21-43; Tuesday January 24: Mark 6:1-13; Wednesday January 25: Mark 6:14-29; Thursday January 26: Mark 6:30 - 4:6; Friday January 27: Mark 6:47-56; Saturday January 28: Mark 7:1-23. Pray your own prayers.